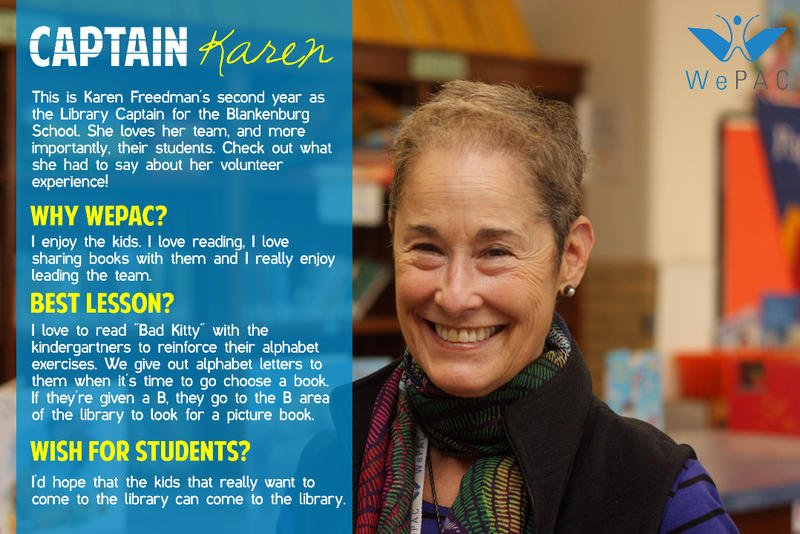 We sat down with Karen, the Captain of the volunteer library team at the Blankenburg School to talk about the program there. She shared some of the triumphs and challenges of working in the program, and most important, all of the wonderful parts about working with her students! Be on the look-out for more interviews with wonderful WePAC volunteers in the future. WePAC: How did you hear about WePAC and which programs/schools do you work with? Karen: I read about WePAC in the newspaper article three years ago and thought that was the kind of thing I’d want to be involved with. I’d done other volunteer work but I didn’t want to raise money and I didn’t want to be on a board. I wanted to do some direct service. WePAC: Why WePAC? What is your favorite part of working in your school? Karen: I enjoy the kids when they’re behaving (laughter). But I enjoy the kids. I love reading, I love sharing books with them and I really enjoy leading the team. I hope I’m helping all the team members to do what they need to do, or what they want to do. We’re all volunteers so everybody has to feel part of it. WePAC: Do you have any cool lessons planned/what has been your favorite lesson so far? Karen: We’ve done a bunch of different things. We did land masses with one class. They were doing land masses and we used these old National Geographics and had the kids look for land masses and did collages by table. The teachers really liked it and the kids got to see a magazine they never would have looked at before. So that was interesting. I love to read Bad Kitty with the kindergartners to reinforce their alphabet exercises and then we’ve given out alphabet letters to them when it’s time for them to go choose a book. If they’re given a B they go to the B area of the library to go look for a picture book. It seems to have worked really well in making them aware of where things are, sequencing of letters and structuring how they use the library so they aren’t just running all over the place. WePAC: What tips for success would you give to future volunteers? Karen: One thing I do really try to impress on everybody is to keep the log so we know what we’ve done and have a record of everything we’re doing. Otherwise it gets very confusing. This way we don’t repeat what we did with the first grade last year with the second grade this year. It was very important to start off with more structure for the library and trying to learn the kids’ names which is really hard, so we have this elaborate name tag system. We made a concerted effort to do that. It helps us, especially when there’s so many kids in the classes. And we really are intent about trying to give them an activity, especially with the little ones. Some art work or something they don’t get a lot of in class. My goal is to expose them to a wider world than what they’re used to or what they know through vocabulary or different books that they may never think of. A lot of them will go to the Disney shelf and look for Aladdin or something they know already but it’s trying to get them to realize that there’s a bigger world.